From artless slob to suave ­­­­­­­sophisticate, the transformation of protagonist Eddie Morra is a classic makeover tale that has you rooting for the underdog-turned-mastermind. The source of his newfound intelligence? An underground designer drug by the unprepossessing name of NZT-48. By boosting his mental abilities, NZT catapults Eddie’s life into the fast-lane. But before long, his overnight success story starts to crumble; just as NZT’s addictive qualities and unfortunate side effects begin to emerge, so too do mysterious strangers and Russian thugs. Without divulging the ending, let’s explore a basic premise of Limitless. Early on, Eddie’s drug-dealing ex-brother-in-law describes how NZT releases the untapped potential of unused brain regions. He begins with, “You know how they say we can only access 20 percent of our brains?” And with that, our suspension-of-belief goggles turn on. While pop culture might persist in this claim, neuroscience certainly doesn’t. Still, it’s an attractive idea that the key to increased potential lies within one’s (skull?) grasp, which might be why the movie’s plot is so compelling. But where did this “20% myth” come from? In Hong et al. 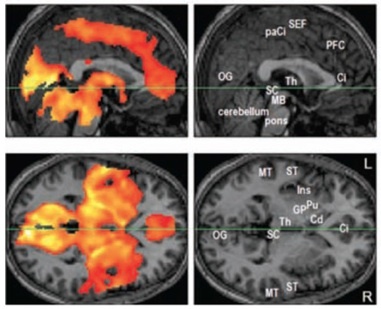 (2009), fMRI scans indicate widespread activation in the brain during REM sleep. Left panels indicate areas with statistically significant activity (colored) from sagittal and horizontal sections. Supplementary right panels provide reference for anatomical regions of interest, e.g. OG=occipital gyrus (for vision); ST=superior temporal gyrus (for hearing, language); GP, Pu, Cd= Globus Pallidus, Putamen, Caudate Nucleus (for voluntary motor control). Setting aside the initial neuroscience blunder, Limitless still intrigues with its surprisingly not-so-sci-fi concept. It’s very human to fantasize about superhuman brainpower, and while the explosive effect of NZT is certainly Hollywood-sized, the hunt for cognitive enhancers is very real. There’s a pressing need for drugs that address a range of cognitive-related conditions. From medications that mitigate cognitive decline in Alzheimer’s patients, to pills that promote attentional focus in people with ADHD, cognitive enhancers already exist and have long been in widespread use. Ritalin, another ADHD medication with pyschostimulant properties. 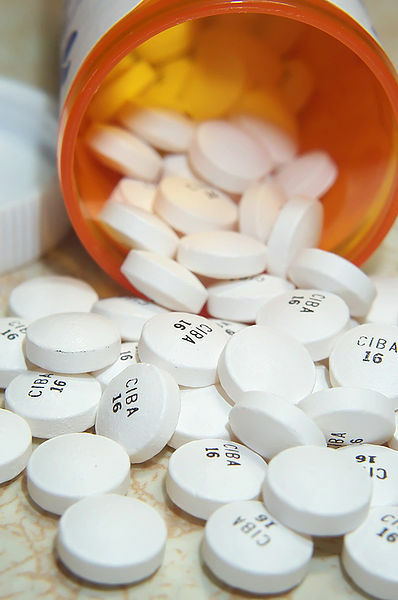 Today, amphetamine is commonly distributed as Adderall, an ADHD medication. Illicit use of prescription stimulants is becoming increasingly popular in healthy students seeking study aids. A 2012 study of nearly 1300 college students shows that over four years, 31% admitted to non-medical use of prescription stimulants;14 another study, surveying only fraternity members, reported prescription stimulant use as high as 55%.15 In the majority of cases, academic motives are the predominant reason for stimulant use,14,15 with Twitter content showing a marked increase in “Adderall-”containing tweets during typical university final exam periods!16 Still, the prevalence, as well as the apparent socially normative use,16 of prescription stimulants highlights the very real and present demand for a real-life NZT. Taken together, this all points to the very human desire for more—the hope that there’s still hidden potential yet to unlock in our minds. But already, the brain is arguably the most sophisticated, baffling computing device in existence. That unassuming glob of gelatinous stuff in our heads, made from tens of billions of neurons and containing more synapses17 than there are stars in our galaxy, is easily the most complex machine in the observable universe. In years to come, pop culture may still insist that we only use a fraction of our brains, but really it’s that we only understand a fraction of our brains. In actuality, it’s the amount we can learn from the brain that’s truly limitless. 1. Aamodt, Sandra & Wang, Sam. Welcome to Your Brain: Why You Lose Car Keys but Never Forget How to Drive and Other Puzzles of Everyday Life. New York, NY: Bloomsbury USA, 2008. 2. Carnegie, Dale. How to Win Friends and Influence People. New York, NY: Simon and Schuster, 1936. 4. James, Williams. (1907) The energies of men. 5. Hong, Charles C. et al. (2009) fMRI Evidence for Multisensory Recruitment Associated With Rapid Eye Movements During Sleep. Human Brain Mapping 30:1705-1722. 6. Tsuno, Norifumi. (2009) Donepezil in the treatment of patients with Alzheimer’s disease. Expert Rev. Neurother. 9(5): 591-598. 7. Rokem, A et al. (2013) The benefits of cholinergic enhancement during perceptual learning are long-lasting. Front Comput Neurosci 7:66. 8. Zeeuws, I et al. (2010) Effect of an acute d-amphetamine administration on context information memory in healthy volunteers: evidence from a source memory task. Hum Psychopharmacol: 25(4):326-34. 9. Wood, SC et al. (2009) Memory and psychostimulants: modulation of Pavlovian fear conditioning by amphetamine in C57BL/6 mice. Psychopharmacology (Berl). 202(1-3):197-206. 10. Yesavage, JA et al. (2002) Donepezil and flight simulator performance: effects on retention of complex skills. Neurology 59(1):123-5. 11. Estrada, A et al. (2012) Modafinil as a replacement for dextroamphetamine for sustaining alertness in military helicopter pilots. Aviat Space Environ Med. 83(6):556-64. 12. Borin, Elliot. The U.S. Military Needs Its Speed. Wired (10 Feb 2003). 13. Imperato, A et al. (1993) Effects of cocaine and amphetamine on acetylcholine release in the hippocampus and caudate nucleus. Eur J Pharmacol 238(2-3):377-81. 14. Garnier-Dykstra, LM et al. (2012) Nonmedical use of prescription stimulants during college: four-year trends in exposure opportunit, use, motives, and sources. J Am Coll Health. 60(3):226-34. 15. Desantis, A et al. (2009) Nonmedical ADHD stimulant use in fraternities. J Stud Alcohol Drugs 70(6):952-4. 16. Hanson, CL et al. (2013) Tweaking and tweeting: exploring Twitter for nonmedical use of a psychostimulant drug (Adderall) among college students. J Med Internet Res. 15(4):e62. 17. Tang, Y et al. (2001) Total regional and global number of synapses in the human brain neocortex. Synapse 41(3):258-73.